A very loose dramatisation of the infamous Enfield 'haunting' of the late '70s. For a two year period in the late 1970s, the events purported to be occurring at an otherwise nondescript council house in the London suburb of Enfield simultaneously captured the imagination and inspired the derision of the British public. Single mother Peggy Hodgson and her four children claimed the house was haunted and the family was being terrorised by a malevolent force, its attentions seemingly centred on 11-year-old Janet Hodgson. A media circus soon sprang up, with TV and print media sending journalists round to the Hodgsons whenever it was a slow news day. Footage available on Youtube shows Janet clearly faking the voice of the spirit she claims is haunting her, and at one awkward point, when a TV reporter asks her if the house is haunted, she forgets herself and replies that it isn't, drawing the ire of her older sister Margaret, who immediately tells her to "shut up". A photographer for the tabloid The Daily Mirror was camped out in the Hodgson home, but despite claiming to have seen such phenomena as Lego bricks flying through the air of their own accord, he failed to capture anything remotely inexplicable on film. Despite no evidence to back up Janet's story, many believe the case to be genuine. If, like me, you assume it was a hoax carried out by an imaginative and attention seeking young girl, then you have to raise a glass to Janet. She came up with some really good material (the line "I'm not a heaven man" is chilling in its implications, all the more creepy for its childlike innocence), and she understood how to draw in an audience by building her story gradually, stringing it out for close to two years. She's a hell of a better storyteller than writer-director James Wan, that's for sure. Wan hits us over the head with a mallet immediately, rarely allowing us to draw breath as he applies his now notorious cattle prod over and over. With loud jolts in place of visually inspired dread, this isn't psychological horror, it's physical trauma. I feel like every time a mainstream Hollywood horror movie comes out, I find myself having to explain the difference between shocks and scares, but at this point I can't be bothered. Suffice to say shocks are cheap and easy, and are Wan's stock in trade, while scares seem largely beyond him. The Conjuring 2 isn't merely a bad horror movie, it's also a deeply problematic one. This comes right from the get go, when a pre-credits sequence takes us inside the infamous Amityville house (infamous in that the world and its dog now knows that case was indeed a hoax), where the Warrens - Ed (Patrick Wilson) and Lorraine (Vera Farmiga) - are attempting to cleanse the building of its spirits. The latter goes into a trance and has a vision in which she enters the body of Ronald DeFeo, who murdered six of his family members in the house in 1974. This part of the Amityville case is indeed true, which makes the grisly re-enactment here particularly distasteful. Following this experience, Lorraine tells her husband she wants out of the ghost-hunting game, and Ed reluctantly agrees. We then cut to London, and you'll never guess what piece of music plays over the introductory montage of the UK capital; yep, London bloody Calling! This is an early sign that we're in for 135 minutes of lazy and uninspired filmmaking. The depiction of Peggy Hodgson (Frances O'Connor) provides the next contentious issue. Footage filmed at the time shows a modest but immaculately kept working class home, but here Peggy's house is filthy and falling apart, implying that, as a single mother, she can't keep on top of things. If only she had a man around the house. Well, as luck would have it, after convincing Lorraine to come out of retirement, Ed jets over to London, rolls up his sleeves and sets about ridding the Hodgson house of not only evil spirits, but dry rot. We've seen plenty of horror movies featuring Christian protagonists defeating evil with the power of their faith, and as a non-believer I find that's perfectly fine, but like this year's other horror stinker, The Darkness (also helmed by an Aussie filmmaker, curiously enough), Wan's film goes out of its way to promote its particular brand of faith at the exclusion of others. If you believe the real Janet's story, she was ultimately 'saved' by a Jewish psychic investigator, Maurice Grosse, who spent practically the duration of the 'haunting' working on the case. While Grosse appears here, played by Simon McBurney, the character contributes nothing. It's the Christian duo of Ed and Lorraine who come to Janet's rescue; however, in reality, the duo are said to have spent no more than a single day in the Hodgson home. The movie shows us that it's the Warrens' Christian faith that makes them such successful ghostbusters; I guess Judaism simply doesn't cut the paranormal mustard. As if that isn't enough to wind up Jews, rather than the two year timeline of the actual case, Wan compresses his version down to a couple of weeks, just happening to take place around Christmas! Oy vey! 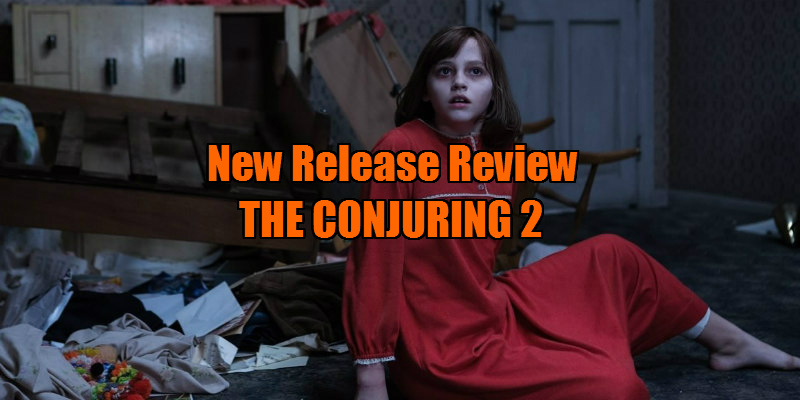 Of course, a movie can be highly offensive and problematic, yet still be a cracking good piece of entertainment - the horror genre is full of such examples - but The Conjuring 2 simply doesn't work as an exercise in terror. Essentially it's just the latest in a seemingly never-ending line of shoddy Poltergeist ripoffs. To his credit, Wan does manufacture one scene that's as good as anything in modern horror (and despite the constant Hollywood fails, overall the genre is in good shape), an extended static take in which Ed interrogates the spirit, half glimpsed in the background due to shallow focus. It's simple, smart, economical and really impressive, which makes the rest of the film all the more irritating for its banality and lack of invention. The rest of the movie is a mundane collection of spook-house clichés, right down to the obligatory toy fire engine coming to life. Despite a run-time of 135 minutes (close to a record for the horror genre), the film somehow never manages to find time to develop any of its characters. Last year's UK TV mini-series, The Enfield Haunting, gave us fully rounded depictions of the real players involved in this case - with nary a crucifix in sight - and you can watch all three episodes in less time than Wan's version. I certainly can't recommend The Conjuring 2, but I make it a rule never to tell readers not to see a movie, no matter how bad. However, the fact that the Warrens - widely believed to be con artists by both the spiritual community and skeptics alike - may be receiving a percentage of ticket sales tempts me to break that rule this one time.